OUR PRICE: $32.30 - Join Rewards Get $1 Dance Dollars On This Item! Mariia's new men and boys collection features gorgeous essentials with impeccable quality. Crafted specifically for men, these "Viggo" convertible tights feature a mid-rise with a 1" elastic waistband, foot openings for custom wear as a full-footed, footless, or capri style tight, and a Mariia tag on the hip. 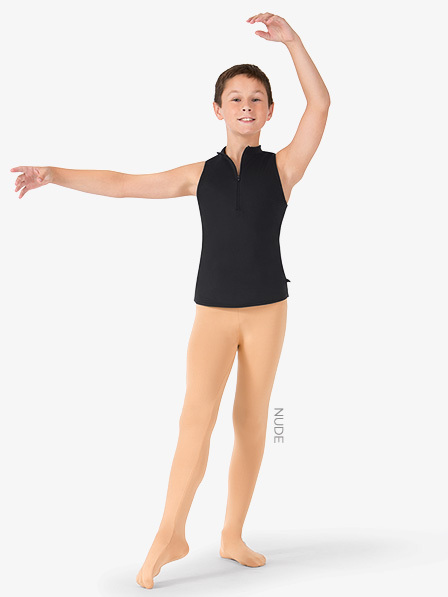 You'll feel confident in the no-slip styling so you can get back to focusing on your dance and not your tights. I usually get a small. Id read the reviews and got a medium but they were still snug! Not for tall men! The medium tights are not for men that are taller than 5'10". I followed the sizing suggestions and now I can't return them, since they don't allow returns on tights. I am very disappointed. The durability is alright. Could be more glossy for stage wear. The only thing is they do not convert the whole foot. Just the toes. There is no possible way to get your toe and heel out without ripping. These tights are perfect. They’re so comfortable and fit well. THE ELASTIC AT THE WAIST ISN'T THE BEST AND AFTER A LITTLE JUMPING THEY FALL DOWN IN CROTCH AREA. PROBABLY NOT THE BEST FOR A TALL DANCER. I'M 6'2" AND WON'T WORK FOR ME.